“The Evolution Series garbage disposals are the world’s most advanced food waste disposers.” At least, that’s what the advertisers over at InSinkErator would have you believe. But of course, while it’s true that not all garbage disposal units were made equal. We still have to look at each product with a critical eye. 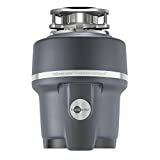 This is exactly what we would do to the InSinkErator Septic Assist 3/4 HP Household Garbage Disposer.We will explore its capabilities as well as limitations, in order to determine whether or not it is truly worth your money. Finally, a great disposal unit that works perfectly for septic systems and it doesn’t even cost $200 dollars. The InSinkErator Evolution Septic Assist is a great choice for homeowners running this system because it is efficient and reliable. We will also try to uncover the reasons that lead the manufacturers to believe that this belongs among some of the world’s most advanced disposers. Let’s have a closer look. As its name suggests, this model’s most noticeable trait is that it is compatible with septic systems. Not a lot of disposers specifically aim for that market. So it is refreshing to find one that goes directly for that kind of system. If you own a septic tank, you’ve probably realized how uncommon it is to find garbage disposal units that are suitable for it. InSinkErator Septic Assist has 3/4 HP of pure grinding action, which lets you turn food waste into mush. The InSinkErator Septic Assist Household Garbage Disposer is designed to be the ideal choice for homes with septic systems. So if you plan on using a disposer on a daily basis, and you run a septic system, then this is the way to go. InSinkErator Septic Assist has a 40 oz stainless steel grind chamber which not only provides additional strength, but also durability. The grind components within this InSinkErator Septic Assist are also conveniently made of stainless steel instead of galvanized steel, thus ensuring longevity. By simply choosing this unit, you ensure that you wouldn’t need to find a replacement model any time soon. Wanting to give septic systems the best possible option, InSinkErator loaded this unit with a bunch of great features to help finally seal the deal. One example is the SoundSeal Technology that it uses to deliver a quiet performance. Who says you have to deal with the noise of blades shredding waste? It also makes use of a MultiGrind system, wherein the food bits go through two stages of grinding. Lastly, it has this unique Bio-Charge feature, which is basically an enzyme treatment that keeps your septic system fresh, and odor-free. It also helps the grinding process by injecting millions of microorganisms that break down the food waste. This is automatically activated every time the disposer is operated. All of these nifty features are bundled in an affordable disposer that currently goes for a price of less than $210 dollars. With almost no disadvantage other than the fact that it is more expensive than 1/2 HP and 1/3 HP units. This is another demonstration of InSinkErator at its finest form.